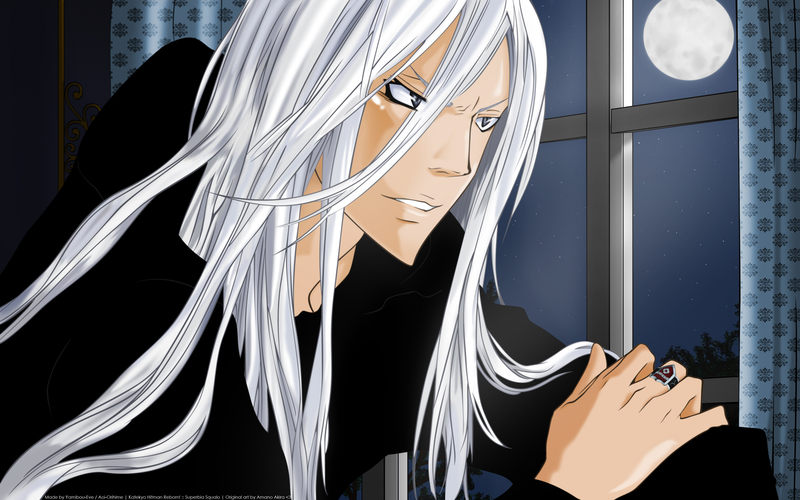 "What a Beautiful Sight" - meaning Squalo of course, not the Moon. Your eye fetish is simply fabulous! XD! I admired your eyes a lot, I was really interested to see what the original looked like... you made miracle with the eyes <3! And the ring --> uwaaau you really made it perfect! Good work! When I can't see something because of the blurriness, I just pretend it isn't there XD and you even found the snapshot and vectored it 0_0 uwaaau again! lol...beautiful sight? he looks pissed off at someone...scary. you can make a new layer and have his white hair over it. light and needs to be brighter, especially for it to be giving out that source of light on him. The blue could use a gradient, it's too flat looking with just that soild color. Oh and I just noticed now, he looks pretty close to the window...maybe he should have a reflection? Just to let people know it's a window and it has glass. I agree with kit-chan about well...everything :) You should cover the eye where the hair goes over it, it'd look definitely better. Uwaa~ I love your details in shadings and color tones. :nya: This is a nice one indeed! The picture is great! Thank you for sharing!